Cute Decor, North Eastern Food & Movies Till 5am! Agape Cafe & Lounge looks like nothing from the outside but once you enter, it’s a rather big, cheery place with yellow walls, flower pots and a lot of north eastern and Chinese food. Starting next week, they’re also going to screen movies and have games every evening going up till 5am! Post party chill scenes here, then? The two partners who run the show here are far from seasoned restaurateurs but they’re trying to keep the cafe afloat by evolving and learning a little every day. 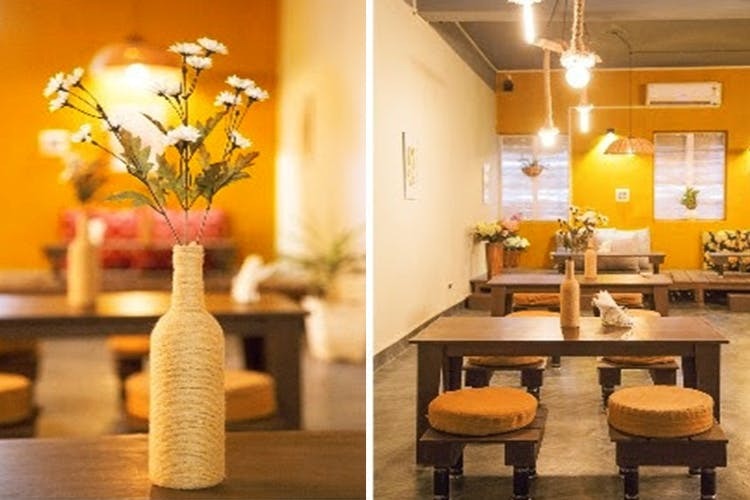 The place they’ve got is spacious and the wooden floor seating is unusual and charming. It’s of course got the looks on its side and we’re told that a bunch of regulars keep coming back because the food reminds them of home. Agape, the word, by the way, means unconditional love. Unlike most other Naga food places, we loved that this one revels in diversity and has an equally impressive dal-naan-Punjabi menu to match. From chicken to fish thalis, bacon salad, pork, noodles, tikkas, burgers and parathas, we see every type of squad member happy here. The experimental ones can try their chili threshold with Pork with Bamboo shoot and rice while the boring ones can stick to the cafe-fare. Or safer still, paneer and butter naan. Our favourite thing from that evening? Chicken Dry Fry which was basically chilli chicken with an amazing twist. Veggies can also try out their noodles which are light and loaded with crispy veggies. They’re also going to add more Thai to the menu, we hear. Agape is barely five-months-old and unfortunately, it does not have the finesse of an established name. This said, there are perhaps a whole lot of things they are doing right… The late night movies and amazing chicken being two prime examples. Caution: Every complaint box should avoid this place or visiting the slightly dirty washroom at the very least.